Definition at line 18 of file RegexData.h. Definition at line 27 of file RegexData.cc. 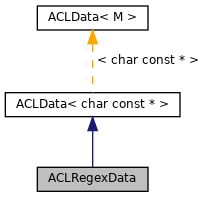 Implements ACLData< char const *>. Definition at line 271 of file RegexData.cc. Definition at line 60 of file RegexData.cc. References data, i, REG_EXTENDED, REG_ICASE, and REG_NOSUB. Definition at line 265 of file RegexData.cc. Definition at line 39 of file RegexData.cc. References data, debugs, and i. Definition at line 242 of file RegexData.cc. References BUFSIZ, cfg_filename, compileOptimisedREs(), compileUnoptimisedREs(), config_input_line, config_lineno, data, DBG_CRITICAL, DBG_IMPORTANT, debugs, ConfigParser::RegexStrtokFile(), and removeUnnecessaryWildcards(). Definition at line 31 of file Data.h. Reimplemented from ACLData< char const *>. Definition at line 32 of file RegexData.cc. Definition at line 32 of file RegexData.h. Referenced by clone(), dump(), empty(), match(), and parse().